Lightly weighted with bead-chain eyes. Slightly smaller than most intruders. Kenny dropped the fly near the far bank of the little riffle. It had swung half way across when the line came tight, and the fresh, bright nine pound hen exploded through he surface of the choppy water three times. Ten minutes later she was in the net getting her picture taken. The Steak and Eggs fly was in the corner of her mouth with the hook clear through her maxillary and through the dressing of the front of the fly. I severed the wire loop rather than try to work the hook back through her jaw. She recovered little worse for wear and swam off strongly. The Steak and Eggs was designed by Travis Johnson. He claims the design was inspired by fishing late season summer steelhead of the Columbia Basin. As a guide on the Deschutes for many seasons, Travis has spent a lot of time seeing what entices fish to the fly. The egg off the back of a light weight intruder is super effective. 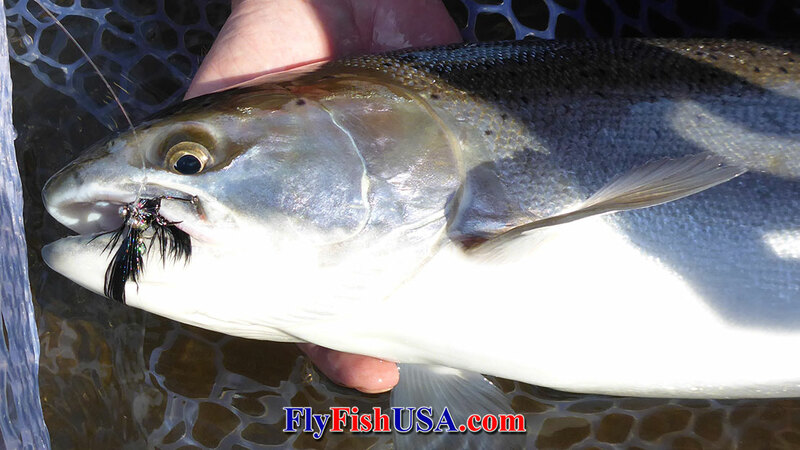 Also if you're in the know on tube flies, the egg can be changed to fit either the angler or the conditions. This has also been a great Alaska pattern. The ability to change the egg to a bead or piece of rabbit makes it super adaptable to the conditions. So whether you're fishing low water winter steelhead, late season summer, Alaska dollies, silvers or big Alaska bow's, Steak and Eggs will have you covered. Light weight enough to cast on a single handed rod. A must-have for your next year's fishing seasons.